Aaron Samuels started getting hype as a poet as an undergraduate at Washington University in St. Louis. A co-founder of the school’s popular slam poetry team, WUSLAM, his compelling performances and the depth of his investigation into what it meant to be black and Jewish made him stand out. He’s continued to make his name on a broader scale since graduating. He’s the Chief Operating Officer of Blavity, a member of the Dark Noise Collective, a group of spoken-word poets, and with a wide swathe of publications in journals and two published collections of poetry, he’s established himself solidly as a working poet. Many of his poems address the intersection and divergence of those identities, including “Broken Ghazal in the voice of my brother Jacob,” published in “Radius” in February 2013, and “when Moses didn’t come home,” published in “Mandala” in 2012. His second book of poetry, “Yarmulkes and Fitted Caps,” was published as the winner of a contest through Write Bloody Publishing. The contest required the submission of both a manuscript and a video; the poem Samuels chose to perform in the video, “Covered in Grass,” is emblematic of his investigation into his joint identity. When I told him that a quick Google search on black Jewish poets hadn’t revealed much he pointed me towards Tova Ricardo, youth poet laureate of Oakland. One of his other favorite black Jewish artists is Lacey Schwartz, whose 2014 documentary “Little White Lie” narrates her journey from being raised as a white Jew to discovering, at eighteen, that her father was in fact African American. He also called my attention to the community of black and Jewish musicians, including, most prominently, Drake. 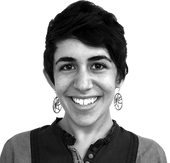 This story "To Be Young, Poetic and Black — and Jewish" was written by Talya Zax. Talya Zax is the Forward’s deputy culture editor. Contact her at zax@forward.com or on Twitter, @TalyaZax.